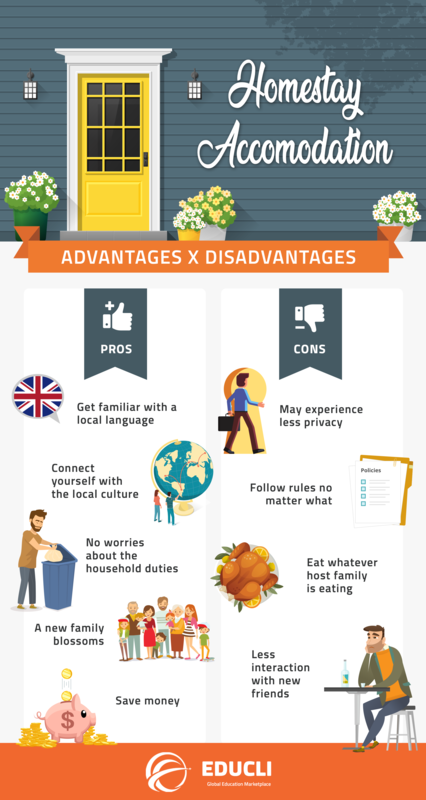 If you are planning to study abroad, one of the first things to consider is where you are going to live, staying with a host family for a short or long period of time, can be life changing. Homestay is a wonderful way to experience another culture life while studying a new language and provides a great opportunity to learn and practise your new language skills. Staying with a local family is also a great cultural experience as you interact daily with a new culture in a family environment. However living with another family can be annoying sometimes. You can fell lack of privacy or either be uncomfortable with the rules and routines of this family. See our pros and cons infographic to decide if this is the best option for you.